Available from Particle & Surface Sciences , the SOLAIR 1100LD portable airborne particle counter delivers 0.10 micron sensitivity and 1.0 CFM (28.3 LPM) flow rates using long life laser diode technology. Conventional HeNe (Helium Neon) particle counters require frequent cleaning, periodic laser tube replacement and suffer low concentration limits. The SOLAIR 1100LD portable airborne particle counter is designed to operate in ISO Class 1 to Class 7 clean rooms without concerns of it degrading its environment or exceeding concentration limits. These portable airborne particle counters use an optics and photodiode system designed to reduce or eliminate the temperature issues associated with high power laser diode sensors. Weighing just 11.8kg and featuring a Li-ion battery option, the SOLAIR 110)LD airborne particle counter is the smallest, lightest, and coolest running 0.10 micron, 1.0 CFM portbale particle counter currently on the market. It also features a thermally-controlled exhaust system and HEPA filter option to prevent any external contamination. The easy to use icon-driven interface with multiple languages simplifies training and SOP writing. It's clean room standard report wizards make the SOLAIR 1100LD an ideal clean room certification tool and eliminate the need for complex UCL calculations. 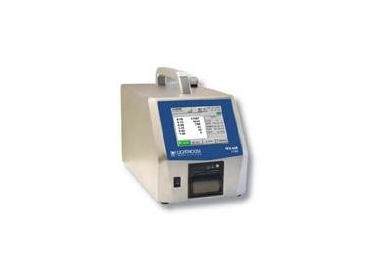 Its flexible communication and data logging capabilities enable the SOLAIR 1100LD portable airborne particle counter to connect to Ethernet or RS-485 networks, connect point-to-point to a PC using USB, or securely export its data to a USB Flash Drive. The SOLAIR 1100LD can be used as a portable instrument or easily integrated into a facility monitoring system.